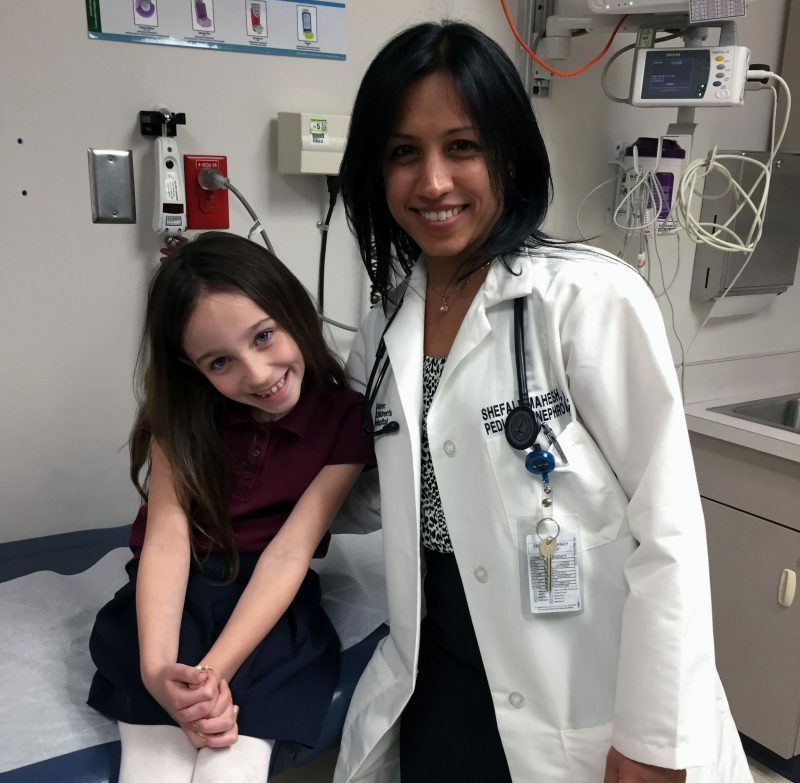 Blakely Kopatz, 6, talks about her kidney stones with Dr. Shefali Mahesh at our new Pediatric Kidney Stone Clinic. When we think of “kidney stones,” the image of the typical patient is usually not of a fresh-faced first grader. But Blakely Kopatz, 6, who has recently had 2 surgeries, proves that kidney stones are not just an ailment of adulthood. Akron Children’s Hospital has created a new service – a Pediatric Kidney Stone Clinic – in response to the increasing number of children and teens experiencing the health complications of stones in the kidney, ureter and bladder. Kidney stone disease in children and teens has increased five-fold from the late 1990s to the early 2000s and now accounts for 1 in 685 hospital admissions for children. Many experts believe the increase in incidence and prevalence can be attributed to major dietary and environmental changes in the United States. Having cared for stone patients for more than decade, Dr. Mahesh saw the need for a multi-disciplinary stone clinic for pediatric patients in Northeast Ohio. Blakely’s kidney stones appear to have a genetic/metabolic connection since her mom, Angela Fisher, has had several of them her early 20s. Blakely’s symptoms began with blood in her urine and mild stomach pain. After her second ER visit and x-ray confirmation of stones, she was referred to Akron Children’s new clinic. During her first surgery, Dr. Curtis Clark, a pediatric urologist, used a laser to break a stone that has settled at the bottom of her left ureter. Stents were left in place to make sure swelling wouldn’t prevent urine flow. A second surgery removed the stents and two smaller stones in the right kidney and ureter. For Fisher, having a diagnosis to explain Blakely’s mysterious symptoms was actually a relief. As part of the clinic, Blakely’s urine and stones were analyzed and she was determined to have the calcium oxalate stones, the most common type. Blakely learned that drinking at least 2 liters (8 cups) of water each day is perhaps the most important thing she can do to prevent future stones from forming. 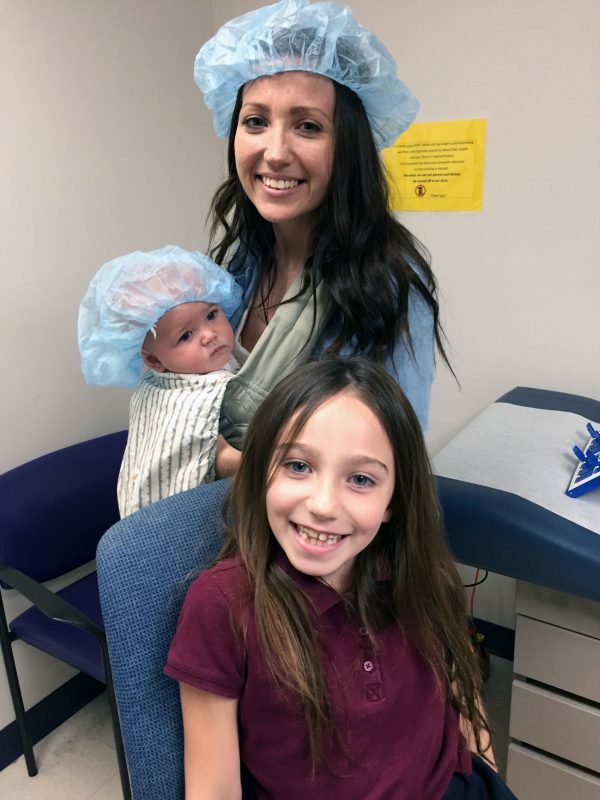 Blakely had fun getting ready for her surgery by practicing putting surgical caps on her mother Angela Fisher, and sister Lucille Fisher, 7 months, during a their visit to the Kidney Stone Clinic. Like adults, kidney stone attacks can be very painful in children and teens, prompting emergency room visits and hospitalizations. Symptoms of stones in the urinary tract may include blood in urine, generalized or acute abdominal pain, nausea, and vomiting. Treatment of children with kidney stones is similar to adults – offering pain management and increasing hydration to allow small stones to pass on their own, or using surgical techniques to remove larger stones. Long-term, having recurrent kidney stones puts adults and children at risk for worsening kidney function, increased bone fractures and higher rates of cardiovascular disease. Patient and parent education for prevention of future stone formation will be a major goal of the new clinic. Reducing animal protein – consider having two or more meatless days per week – increasing fruits and vegetables and limiting are also recommended ways to prevent stones. Adding lemon to water can also be helpful as citrate is a natural stone inhibitor. Diets high in fat, sugar and processed foods aren’t necessarily the only problematic ones. Without proper education, low-carbohydrate, high-protein and even vegan diets can put children and teens at higher risk for stones, and special diets are becoming more prevalent in children and adults alike, noted Natalie Lussier, renal dietitian. For more information about Akron Children’s Kidney Stone Clinic, please call 330-543-8950.